Home> Resource> iOS Transfer> How to Transfer Contacts (Phone Number, Email Address, etc.) from iPhone to iPhone? I have used an iPhone 5S for couple of years, and I'm going to buy a new iPhone 8 Plus in the coming Christmas day. But I'm frustrated of how to move the contacts on my iPhone 5S to the new one. My phone's SIM card only can save several numbers but I have hundreds of contacts on the device, so is it possible to transfer contacts from iPhone to iPhone at one time? This is really important for me, please help! Nowadays, contacts in your iPhone might be one of the most important things, right? So when you switch your iPhone from the old one to the new iPhone 7/6 or 6 Plus, you must wish to directly copy the whole contacts from the old iPhone 5/5S/6/6S/SE to the new iPhone because adding contacts to the new device manually could be a disaster for all of iPhone users, especially when you have saved hundreds yet thousands of contacts on the device. Actually, if you have installed iTunes on your computer, you can make a iPhone 4 backup at first, then restore the backup file to the new iPhone 6 or 6 Plus. However, some users complains the contacts are disappeared during the restoring process with iTunes, so more and more users wish to find a way to share contacts between iPhone devices with zero losing. That's why we kindly recommend iPhone to iPhone Transfer program here. 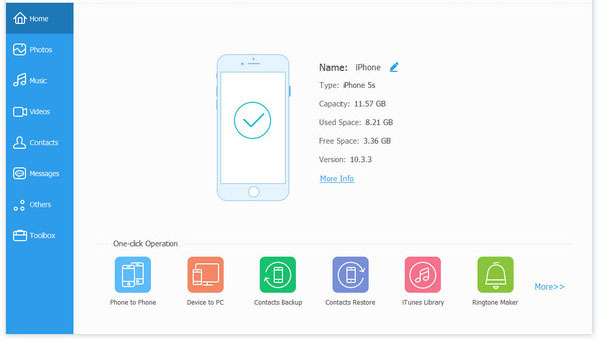 With it, you can transfer contacts between two iDevices easily and quickly, and you're even allowed to move contents between mobile phones in different operating system like iPhone and Android. The recommended tool comes with an user-friendly yet easy to use interface design, and requires no professional skills for both beginners and experts. Now, just click the below icon to install the powerful program on your computer, then follow the below steps to transfer contacts (phone number, email address, etc.) between two iPhone as you like. - Connect your source and target iPhone to the comptuer at the same time, then launch the iPhone Transfer program. It will detect the linked iPhones well, and you can see the connected device list in the top left corner as you like. - Click "Information" on the top menu, and choose "Contacts" in the left panel. Now, you can check all contacts info in the program. - Select the contacts you wish to move, then click "Export" button on the sub-menu, then choose "to Device" and select your target device name in the drop down list. - Wait for a little while, the transferring process will be finished, and all your selected contacts have been saved on your target iPhone without losing. Click "Next" and you'll see the file types that can be moved. Directly tick the option of "Contacts" and hit "Transfer" button to begin the process. When the transferring is finished, you can check the contacts list on your target iPhone as you like. iCloud comes with your iPhone, and provide users with a fast way to backup and restore their iPhone data. So if you're going to copy iPhone contacts from one to another, you can take the iCloud as an option. However, 2 things you should be known before syncing iPhone contacts with iCloud. 2. iCloud syncing will help you restore the whole contents on your new iPhone. That means you can't select what to transfer or not. So if you wish to transfer specific contacts on iPhone than all the contacts, please turn to the method 1 to reach your goal. - Go to "Settings > iCloud > Contacts" on your old and new iPhone, then turn it on. - Select "Merge" option on your new iPhone when it remind you that "Your contacts will be merged with iCloud". Now, you only need to wait for the contacts on old iPhone be syncing to new iPhone. Here, you also can use the iCloud backup & restore function to finish the contacts transaction between iPhones. But you should be noted that the backup & restore function will restore the whole contents of your old iPhone to the new device, that means it will erase the existing data on your new iPhone. - Make a backup of your old iPhone by clicking Settings > iCloud > Backup. - Restore the old iCloud backup on new iPhone by hitting Settings > General > Reset > Erase All Content and Settings > Erase iPhone > Select Restore from iCloud > Select the backup file. How to Transfer Contacts from iPhone to iPhone with iTunes? The steps of transferring iPhone contacts to new iPhone with iTunes is similar with sync iPhone contacts by using iCloud backup & restore function. First of all, you need to make a backup of your old iPhone with iTunes. To do it, you need to connect your old iPhone to computer, and open iTunes, then click "Summary", and choose "Back up Now" option. If you have backed up your iPhone contacts before, you can skip this step. Secondly, restore new iPhone with old iTunes backup. Here, you just need to connect your new iPhone to the computer, and click "Restore Backup" option to perform the restoring.